This is an SMB2J any% run with most optimized stages and latest techniques, and a 27-frame improvement over my last run in 2011. I didn't expect my last run could be improved, until a week ago, I found a faster way of falling in the water after hitting a ceiling, which saves 1 frame from the water stage in 8-4. The key is to maximize the falling speed by just the right swimming strength. By then I thought: "Oh, great, another 1-frame improvement. How would I dare to submit it this time..." But when I started testing some previous stages, it shocked me that I could pass the wall by bouncing on a Goomba without losing speed after all, saving a frame rule (21 frames) in 1-2, something I thought was impossible 5 years ago. 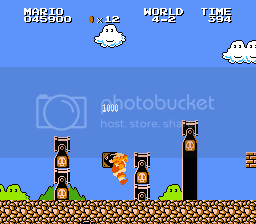 The key is to manipulate the loading time of the two Goombas, and to jump very precisely. Both stages have been improved during the last run. I'm surprised that they can be improved even further. The other 5 frames come from the first stage of 8-4. They were lost due to bad luck at the Podoboo in the last run, but are now back. With every stage fully optimized, I boldly predict that this would be the speed limit and the very last any% run of SMB2J, along with SMB warped run. I guess it's more interesting if you imagine it as a "kiss", rather than killing Lakitu the same frame it turns around. Back when I was making the SMB2J Luigi TAS, I thought time wouldn't allow Mario to jump through the long firebar at the beginning of 4-4, but it turns out that it does, just barely for Mario to catch up with the frame rule. It's only possible thanks to the fast pipe entering trick I found during the Luigi TAS. Watching such quick kill, can you see how many fireballs are used? This time, I changed the location getting the Fire Flower to a much dangerous place, which no TAS has ever set foot on. Although it only doesn't waste time because of the frame rule, I find it more entertaining, because getting the flower earlier helps to clear some enemies on the way, and the movement itself is pretty extreme and even more difficult than it seems. Masterjun: Oh man, saving the frames! Judging. Masterjun: Solid optimization, and cool idea to use the frame rules as an opportunity to entertain a bit more! Accepting to Moons as an improvement to the previous run. Spikestuff: Publishing, and encoding 13 times over Nevermind. Famtasia Screwed me.